Two items in the news this week put in graphic relief the overarching reality of our times: Wall Street is every day tightening its dictatorial grip on the political and economic life of the United States. The American state and economy are being relentlessly restructured in order to further consolidate the rule of finance capital. In the largely Black urban centers of the nation, the oligarchy intends to rule directly, without the inconvenience of meaningful elections and the other trappings of democracy. Detroit proves the point. 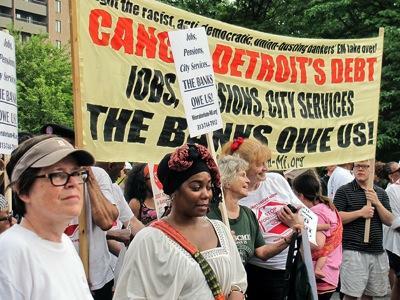 This week, a judge begins a bankruptcy court trial that will decide if local corporate dictator Kevyn Orr, the emergency financial manager imposed by the state to protect the interests of Wall Street, will essentially be allowed to sell Detroit’s assets to a British bank in order to pay off the city’s debts to American banks. The pensions of city workers may also be gutted in the process. The city council of Detroit this week voted unanimously against the deal, but that is probably irrelevant, since the emergency manager law has stripped all power from Detroit’s elected officials. Democracy is dead in Detroit, as it is in all of Michigan’s largely Black cities, every single one of which is now run by a corporate dictator. The majority of Michigan’s African American citizens have no more electoral rights than did Blacks in South Africa under apartheid. This new political regime has been carefully crafted to the specifications of Wall Street. City revenues from Detroit’s casino and income taxes will go directly through accounts of Barclays Bank. And if, for some reason, the emergency manager loses legal control of the city, then Barclays would be allowed to declare Detroit in default and begin seizing its assets, for liquidation – that is, the bankers would be empowered to exercise outright ownership of the city. Detroit will then serve as a model for the rest of urban America. Also this week, the U.S. Justice Department reached an agreement with JP Morgan Chase, the country’s biggest bank in terms of assets, whose chairman and chief executive, Jamie Dimon, is a good friend of President Obama. The settlement calls for $9 billion in fines and sets aside $4 billion in relief to homeowners that were victimized by the banks’ mortgage securities practices. Nobody, of course, will go jail or even face criminal charges for the multitude of felonies committed by high JP Morgan executives – crimes that would be categorized as racketeering offenses were the perpetrators not part of a ruling class that is immune from prosecution. Jamie Dimon, the Godfather of JP Morgan’s criminal enterprise, has the privilege of bargaining with the U.S. Attorney General over the size of the fine his bank will pay. Dimon himself, of course, won’t pay a cent, despite his role in throwing millions out of work and costing the world economy many trillions of dollars. His class has emerged from the crisis they created stronger than ever: too big to fail, too big to jail, more than big enough to gobble up Detroit, bigger than the voting rights of U.S. citizens – especially Black citizens – which can be cancelled when democracy gets in the way of Wall Street. All Power to the Bankers!